Cpl. 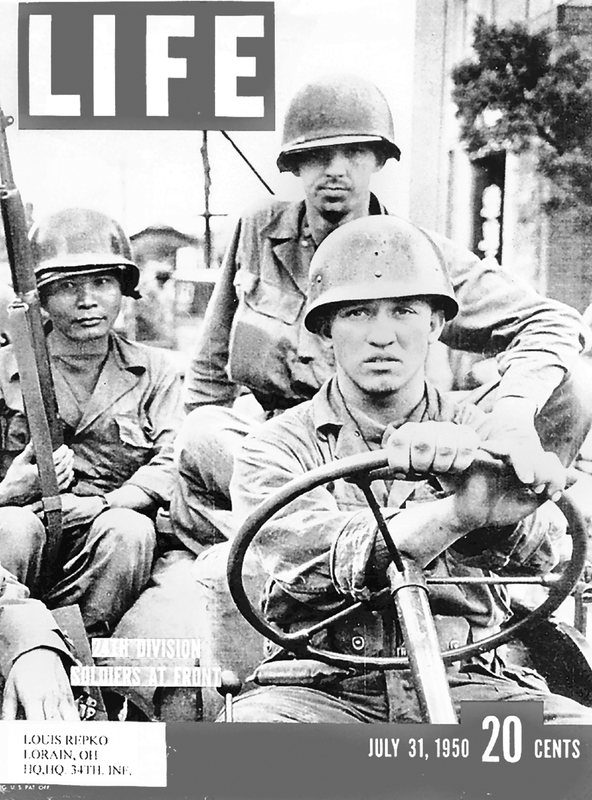 Lou Repko is at the wheel of the Jeep during the first day of the Korean War. Repko winters in Craig’s RV Park near Arcadia, Fla.
Cpl. Lou Repko is at the wheel of the Jeep during the first day of the Korean War. Repko winters in Craig’s RV Park near Arcadia, Fla. Click on any image to enlarge. It’s not often a G.I. make the front cover of Life magazine. 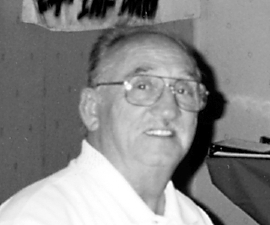 Lou Repko, an Ohio “snow-bird,” who winters at Craig’s RV Park near Arcadia, Fla., did so more than 50 years ago while fighting as a member of the 24th Infantry Division in Korea. The picture credited to Carl Mydans, a Life photographer, was actually taken by Marguerite Higgins, a reporter-photographer working as a foreign correspondent for the New York Herald Tribune, according to Repko. It shows him driving a Jeep with two more armed soldiers beside him. It appeared on the front of the July 31, 1950 edition. The actual picture Higgins shot shows Repko’s sergeant in the front seat beside him and another soldier in the back seat. They were cropped out so that Life could use it as a vertical photograph that fit its front cover. In reality the other two men who appeared on the cover of the magazine with Repko didn’t fare any better than the other soldiers who didn’t appear on the cover. Sunday morning June 25, 1950, following an intensive artillery barrage, 90,000 North Korean troops armed with Russian-made equipment attacked unprepared Republic of Korea troops. Spearheading the enemy attack were 150 T-33 Russian tanks. The Republic of Korea (ROK) forces were overwhelmed by seven North Korean infantry divisions. Within two days Soul, the South Korean capital city, was being abandoned by the ROK troops. To bolster the South Korean troops who were losing ground to the enemy, President Harry Truman sent the 24th and 34th Infantry Regiments from Japan. That didn’t stop the North Korean attack on their brothers in the south. There were charges some of the American soldiers involved in the initial battles had “bugged out” – left their posts. As a result, they endangered the Eight Army’s flank, and gave the enemy access to the American front lines. After the first six months of defensive fighting in Korea, the American Army learned once more the value of a well-trained, well-armed force ready for all combat eventualities. Repko joined the Army at 16 with his mother’s permission. They both stretched the truth about his age when the induction officer inquired. He had five older brothers who served in World War II. “They told me to get my military obligation over during peace time. I joined the Army in January 1949 when nothing was going on,” he recalled. “Since four of my five brothers had served in Japan, I wanted to go there, too. “When the Korean War broke out on June 25, 1950, I was serving in the 34th Regiment, 24th Infantry Division stationed in Sasebo, Japan. We were notified at 6 p.m. the next day the war was on. We were taken by ship to Pusan, South Korea. Although he was classified as a motor pool driver, he was also in communications. His job was to string telephone lines from the forward command post back to headquarters so commanders could stay in communications with their front line troops. “It was July 18, 1950, and our regiment kept falling back in the face of the North Korean onslaught. We went into Taejon with 3,000 troops and came out a few days later with 500,” Repko said. “We didn’t know the enemy had us surrounded when we set up headquarters there. “Gen.William Dean, our commander, had orders we had to hold the town as long as we could,” he said. “It was mountainous terrain and the town was down in the valley. The enemy had lots of mortars and they could drop a mortar shell in your back pocket. Marguerite Higgins, a correspondent for the New York Herald Tribune said she saw the turret of the enemy tank start to turn her way and that’s when she bugged out. Repko recalled it was Higgins who wrote about the plight of his unit at Taejon in her book, War in Korea, the Report of a Woman Combat Correspondent. Also in the book is the original horizontal picture of Repko at the wheel of the Jeep that appeared on the cover of Life. “As the enemy tanks rolled into town, they fired a couple of rounds at our headquarters that did little damage,” he said. “Two of my buddies had a bazooka and they tried to knock out the tank, but the bazooka shell barely scratched the Russian tank. “By the time I climbed in a Jeep outside and headed out of Taejon, all our people at headquarters had gone. I followed an Army truck to the outskirts of town,” Repko said. “At a ‘Y’ in the road he went one way and I went the other. All of a sudden all hell broke loose. The North Korean artillery let go and set the town on fire. Marguerite Higgins, a New York Herald Tribune reporter-photographer, was the one who took Repko’s picture that appeared on the cover of Life. “I continued down the road about a half mile when I heard an enemy machine]-gun cut loose. American Army troops marching on both sides of the road dove for cover. I don’t know if my Jeep hit a land mine, but it blew up. The next thing I knew, when I woke up, I was lying along the side of the road. There was total annihilation of our soldiers along both side of the road. “Then I heard someone yell, ‘We got ‘em.’ I guess they knocked out the enemy machine-gun with a hand grenade. Repko had injured his leg, but told the general he could still walk. With Dean’s help they rounded up a couple of dozen American soldiers who had survived the shootout with the enemy machine-gun. 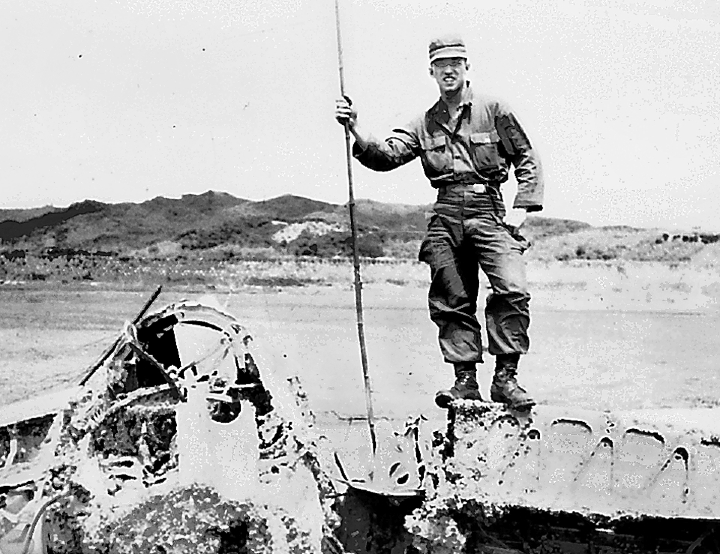 Repko and the American soldiers who survived the machine-gun battle walked until they came across a South Korean who could speak a little English. He guided them to a river and a hut where they hid until dark. After crossing the river at night , the next morning the lost and weary soldiers ran into a platoon from the American 19th Infantry Regiment that took them back to headquarters. 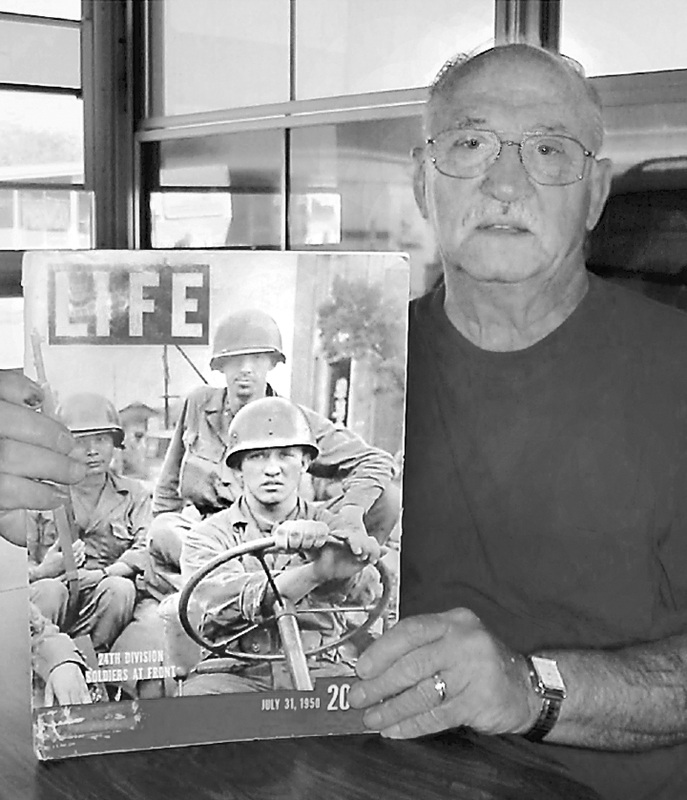 He holds an original copy of Life that shows him as an 18-year-old soldier during the early days of the Korean War. After Taejon, the 34th Infantry Regiment was disbanded because of the appalling losses it suffered. The 400 to 500 soldiers left in the unit after Taejon were split up. Half were assigned to the 19th Infantry Regiment and the rest to the 21st Regiment. For the rest of his tour in Korea he had a gravy run. Most of the time he was a designated driver in the regimental motor pool. Repko doesn’t recall exactly when and where the picture of him was taken that appeared on the cover of Life. However, he remembers well when he first saw it. “I had to drive this major to Pusan for a metering. The next morning he came running out of the meeting saying, ‘Look what I found.’ He handed me a copy of Life with my picture on it. He had just told the people in the office where he had been meeting that the guy on the over was his driver who was parked in a Jeep outside,” Repko said with a smile five decades later. Commendations: Combat Infantryman’s Badge, Bronze Star, Presidential Unit Citation, Korean Service Medal, Occupation of Japan Medal, Medal of Korea, National Defense Medal. This story was first published in the Charlotte Sun newspaper, Port Charlotte, Fla. on Sunday, June 20, 2004 and is republished with permission. One correction needs to be made. Near the end of the article, the writer reports the 24th Infantry Regiment was disbanded. This is an understandable error. It was the 34th Regiment that was disbanded. The 24th Infantry Regiment (not connected to the 24th Infantry Division) was an all-Black regiment with the 25th Division.